As part of the Atlantic Wall, between 1940 and 1945 the occupying German forces and the Organisation Todt constructed fortifications round the coasts of the Channel Islands such as this observation tower at Battery Moltke. The German occupation of the Channel Islands lasted for most of the Second World War, from 30 June 1940 until their liberation on 9 May 1945. The Bailiwick of Jersey and Bailiwick of Guernsey are two British Crown dependencies in the English Channel, near the coast of Normandy. The Channel Islands were the only part of the British Isles to be occupied by the Wehrmacht (German Armed Forces) during the war. Anticipating a swift victory over Britain, the occupiers experimented by using a very gentle approach that set the theme for the next five years. The island authorities adopted a similar attitude, giving rise to accusations of collaboration. However, as time progressed the situation grew gradually worse, ending in near starvation for both occupied and occupiers during the winter of 1944–45. Between 3 September 1939, when the United Kingdom declared war against Germany, and 9 May 1940, little changed in the Channel Islands. Conscription did not exist, but a number of people travelled to Britain to join up as volunteers. The horticulture and tourist trades continued as normal; the British government relaxed restrictions on travel between the UK and the Channel Islands in March 1940, enabling tourists from the UK to take morale-boosting holidays in traditional island resorts. On 10 May 1940, Germany attacked the Netherlands, Belgium, and Luxembourg by air and land and the war stepped closer. The Battle of France was reaching its climax on Empire Day, 24 May, when King George VI addressed his subjects by radio, saying, "The decisive struggle is now upon us ... Let no one be mistaken; it is not mere territorial conquest that our enemies are seeking. It is the overthrow, complete and final, of this Empire and of everything for which it stands, and after that the conquest of the world. And if their will prevails they will bring to its accomplishment all the hatred and cruelty which they have already displayed." On 11 June 1940, as part of the British war effort in the Battle of France, a long range RAF aerial sortie carried out by 36 Whitley bombers against the Italian cities of Turin and Genoa departed from small airfields in Jersey and Guernsey, as part of Operation Haddock. Weather conditions resulted in only 10 Whitleys reaching their intended targets. Two bombers were lost in the action. On 15 June, after the Allied defeat in France, the British government decided that the Channel Islands were of no strategic importance and would not be defended, but did not give Germany this information. Thus despite the reluctance of Prime Minister Winston Churchill, the British government gave up the oldest possession of the Crown "without firing a single shot." The Channel Islands served no purpose to the Germans other than the propaganda value of having occupied British territory. The "Channel Islands had been demilitarised and declared...' an open town'". On 16 June 1940, the Lieutenant-Governors of each island were instructed to make available as many boats as possible to aid the evacuation of Saint-Malo. Guernsey was too far away to help at such short notice. The Bailiff of Jersey called on the Saint Helier Yacht Club in Jersey to help. Four yachts set off immediately, with 14 others being made ready within 24 hours. The first yachts arrived in Saint-Malo on the morning of 17 June and embarked troops from shore to waiting transport ships; the remaining yachts from Jersey arrived on 18 June and helped clear the last parties from land. On 17 June 1940, a plane arrived in Jersey from Bordeaux evacuating Brigade General Charles de Gaulle from France. After coffee and refuelling, the plane flew on to Heston, outside London, where next day the general made his historic appeal of 18 June to the French people via the BBC. The last troops left the islands on 20 June, departing so quickly that bedding and half-consumed meals were left in Castle Cornet. Memorial in Saint Peter Port: "This plaque commemorates the evacuation of children and adults ahead of the occupation of the island by German forces in June 1940. Four-fifths of the children and altogether almost half the population of Guernsey were transported to England so that scarcely a family was undivided. À la perchoine." The realisation of the necessity of civilian evacuation from the Channel Islands came very late. With no planning and secrecy being maintained, communications between the island governments and the UK took place in an atmosphere of confusion and misinterpretation. Opinion was divided and chaos ensued with different policies adopted by the different islands. The British government concluded its best policy was to make available as many ships as possible so that islanders had the option to leave if they wanted to. The British Home Office instructed the Lieutenant Governors that in the eventuality of the recall of the representatives of the Crown, the Bailiffs should take over their responsibilities, and that the Bailiffs and Crown Officers should remain at their posts. The Lieutenant Governor of Jersey discussed with the Bailiff of Jersey the matter of being required to carry on administration under German orders. The Bailiff considered that this would be contrary to his oath of allegiance, but he was instructed otherwise. Last-minute arrangements were made to enable British administration to legally continue under the circumstances of occupation. The withdrawal of the Lieutenant Governors on 21 June 1940 and the cutting of contact with the Privy Council prevented Royal Assent being given to laws passed by the legislatures, The Bailiffs took over the civil, but not the military, functions of the Lieutenant Governors. The traditional consensus-based governments of the bailiwicks were unsuited to swift executive action, and therefore in the face of imminent occupation, smaller instruments of government were adopted. Since the legislatures met in public session, the creation of smaller executive bodies that could meet behind closed doors enabled freer discussion of matters such as how far to comply with German orders. While the Wehrmacht was preparing Operation Grünpfeil (Green Arrow), a planned invasion of the islands with assault troops comprising two battalions, a reconnaissance pilot, Hauptmann Liebe-Pieteritz, made a test landing at Guernsey's deserted airfield on 30 June to determine the level of defence. He reported his brief landing to Luftflotte 3 which came to the decision that the islands were not defended. A platoon of Luftwaffe airmen was flown that evening to Guernsey by Junkers transport planes. Inspector Sculpher of the Guernsey police went to the airport carrying a letter signed by the bailiff stating that "This Island has been declared an Open Island by His Majesty's Government of the United Kingdom. There are no armed forces of any description. The bearer has been instructed to hand this communication to you. He does not understand the German language." He found that the airport had been taken over by the Luftwaffe. The senior German officer, Major Albrecht Lanz, asked to be taken to the island's chief man. They went by police car to the Royal Hotel where they were joined by the bailiff, the president of the controlling committee, and other officials. Lanz announced through an interpreter that Guernsey was now under German occupation. In this way the Luftwaffe pre-empted the Wehrmacht's invasion plans. Jersey surrendered on 1 July. Alderney, where only a handful of islanders remained, was occupied on 2 July and a small detachment travelled from Guernsey to Sark, which surrendered on 4 July. The first shipborne German troops consisting of two anti-aircraft units, arrived in St. Peter Port on the captured freighter SS Holland on 14 July. The islands' governments had a legal and moral requirement to do their best for the population of the islands. This meant preserving life until the islands were liberated. Mistakes were made as there were no guidelines on how a government should act when occupied. Austria was annexed while Czechoslovakia and Poland were invaded and direct German military governments were installed. Denmark installed a protectorate government and stayed in power being passive and accepting a nonaggression pact. [clarification needed] In Norway a government was imposed on the population, the same in the Netherlands and Belgium. France was split in two with their government keeping control of the southern zone. The Channel Islands decided their actions independently of each other and came to very similar passive views, which enabled the existing civil and legal structures to remain in place. The view of the majority of islanders about active resistance to German rule was probably expressed by John Lewis, a medical doctor in Jersey. "Any sort of sabotage was not only risky but completely counterproductive. More important still, there would be instant repercussions on the civilian population who were very vulnerable to all sorts of reprisals." Sherwill seems to have expressed the views of a majority of the islanders on 18 July 1940 when he complained about a series of abortive raids by British commandos on Guernsey. "Military activities of this kind were most unwelcome and could result in loss of life among the civilian population." He asked the British government to leave the Channel Islands in peace. Sherwill was later imprisoned by the Germans for his role in helping two British spies on Guernsey. and when released, deported to a German internment camp. Sherwill's situation illustrated the difficulty for the island government and their citizens to cooperate—but to stop short of collaborating—with their occupiers and to retain as much independence as possible from German rule. The issue of islanders' collaboration with the Germans remained quiescent for many years, but was ignited in the 1990s with the release of wartime archives and the subsequent publication of a book titled The Model Occupation: The Channel Islands under German Rule, 1940–1945 by Madeleine Bunting. Language such as the title of one chapter, "Resistance? What Resistance?" incited islander ire. The issue of collaboration was further inflamed by the fictional television programme Island at War (2004), which featured a romance between a German soldier and an island girl and favourably portrayed the German military commander of the occupation. Bunting's point was that the Channel Islanders did not act in a Churchillian manner, they "did not fight on the beaches, in the fields or in the streets. They did not commit suicide, and they did not kill any Germans. Instead they settled down, with few overt signs of resistance, to a hard, dull but relatively peaceful five years of occupation, in which more than half the population was working for the Germans." Life as a civilian during the occupation came as a shock. Having their own governments continuing to govern them softened the blow and kept most civilians at a distance from their oppressors. Many lost their jobs when businesses closed down and it was hard to find work with non-German employers. As the war progressed, life became harsher and morale fell, especially when radios were confiscated and then when deportations took place in September 1942. Food, fuel, and medicines became scarce and crime increased. Following 6 June 1944, liberation became more likely in the popular mind, but the hardest times for the civilians was still to come. The winter of 1944-45 was very cold and hungry, many of the population being saved from starvation by the arrival of Red Cross parcels. As part of the Atlantic Wall, between 1940 and 1945 the occupying German forces and the Organisation Todt constructed fortifications, roads, and other facilities in the Channel Islands. In a letter from the Oberbefehlshaber West dated 16 June 1941, the reinforcing of the islands was to be carried out on orders of Hitler, since an Allied attack "must be reckoned with" in Summer 1941. Much of work was carried out by imported labour, including thousands from the Soviet Union, and under the supervision of the German forces. The Germans transported over 16,000 slave workers to the Channel Islands to build fortifications. Five categories of construction worker were employed (or used) by the Germans. Paid foreign labour was recruited from occupied Europe, including French, Belgian, and Dutch workers—including some members of resistance movements who used the opportunity to travel to gain access to maps and plans. Conscripted labourers from France, Belgium, and the Netherlands were also assigned. In 1941 hundreds of unemployed French Algerians and Moroccans were handed to the Germans by the Vichy government and sent to Jersey. Around 2000 Spaniards who had taken refuge in France after the Spanish Civil War and who had been interned were handed over for forced labour. Most of the Soviet slave workers came from Ukraine. One thousand French Jews were imported. The fifth category of labour were British conscientious objectors and Irish citizens. As many of the islands' young men had joined the armed forces at the outbreak of war, there was a shortfall in manual labour on the farms, particularly for the potato crop. 150 registered conscientious objectors associated with the Peace Pledge Union and 456 Irish workers were recruited for Jersey. Some chose to remain and were trapped by the occupation. Some of the conscientious objectors were communists and regarded the German-Soviet pact as a justification for working for the Germans. Others participated in non-violent resistance activities. As the Irish workers were citizens of a neutral country (see Irish neutrality during World War II), they were free to work for the Germans as they wished and many did so. The Germans attempted to foster anti-British and pro-IRA sympathies with propaganda events aimed at the Irish (see also Irish Republican Army – Abwehr collaboration in World War II). John Francis Reilly convinced 72 of his fellow Irishmen in 1942 to volunteer for employment at the Hermann Göring ironworks near Brunswick. Conditions were unpleasant and they returned to Jersey in 1943. Reilly stayed behind in Germany to broadcast on radio and joined the Sicherheitsdienst (SD). The Channel Islands were amongst the most heavily fortified parts of the Atlantic Wall, particularly Alderney which is the closest to France. On 20 October 1941 Hitler signed a directive, against the advice of Commander-in-Chief von Witzleben, to turn the Channel Islands into an "impregnable fortress". In the course of 1942, one twelfth of the resources funnelled into the whole Atlantic Wall was dedicated to the fortification of the Channel Islands. Hitler had decreed that 10% of the steel and concrete used in the Atlantic Wall go to the Channel Islands. [contradictory] It is often said the Channel Islands were better defended than the Normandy beaches, given the large number of tunnels and bunkers around the islands. By 1944 in tunneling alone, 244,000 cubic metres (8,600,000 cu ft) of rock had been extracted collectively from Guernsey, Jersey, and Alderney (the majority from Jersey). At the same point in 1944 the entire Atlantic Wall from Norway to the Franco-Spanish border, excluding the Channel Islands, had extracted some 225,000 cubic metres (7,900,000 cu ft). Light railways were built in Jersey and Guernsey to supply coastal fortifications. In Jersey, a 1 metre (3 ft 3 in) gauge line was laid down following the route of the former Jersey Railway from St Helier to La Corbière, with a branch line connecting the stone quarry at Ronez in St John. A 60 centimetres (24 in) line ran along the west coast, and another was laid out heading east from St Helier to Gorey. The first line was opened in July 1942, the ceremony being disrupted by passively-resisting Jersey spectators. The Alderney Railway was taken over by the Germans who lifted part of the standard gauge line and replaced it with a metre gauge line, worked by two Feldbahn 0-4-0 diesel locomotives. The German railway infrastructure was dismantled after the liberation in 1945. The Germans built many camps in Jersey, Guernsey, and four camps in Alderney. The Nazi Organisation Todt operated each camp and used forced labour to build bunkers, gun emplacements, air raid shelters, and concrete fortifications. In Alderney the camps commenced operation in January 1942 and had a total inmate population of about 6,000. The Borkum and Helgoland camps were "volunteer" (Hilfswillige) labour camps Lager Borkum was used for German technicians and "volunteers" from different countries of Europe. Lager Helgoland was filled with Soviet Organisation Todt workers and the labourers in those camps were paid for work done which was not the case with inmates at the two concentration camps, Sylt and Norderney. The prisoners in Lager Sylt and Lager Norderney were slave labourers. Sylt camp held Jewish forced labourers. Norderney camp housed European (mainly Eastern Europeans but including Spaniards) and Soviet forced labourers. On 1 March 1943, Lager Norderney and Lager Sylt, were placed under the control of the SS Hauptsturmführer Max List, turning them into concentration camps. In Jersey the exact number of camps is unclear. Lager Wick camp in Grouville has been investigated, and an estimated 200 workers were housed there. A small number of British and other Jews lived on the Channel Islands during the occupation. Most had been evacuated in June 1940, but British law did not allow enemy citizens, irrespective of their religion, to enter Britain without a permit. When the Germans arrived, 18 Jews registered out of an estimated 30–50. In October 1940 German officials issued the first anti-Jewish Order, which instructed the police to identify Jews as part of the civilian registration process. Island authorities complied, and registration cards were marked with red "J"s; additionally, a list was compiled of Jewish property, including property owned by island Jews who had evacuated, which was turned over to German authorities. The registered Jews in the islands, often Church of England members with one or two Jewish grandparents, were subjected to the nine Orders Pertaining to Measures Against the Jews, including closing their businesses (or placing them under Aryan administration), giving up their wirelesses, and staying indoors for all but one hour per day. The civil administrations agonised over how far they could oppose the orders. The process developed differently on the three islands. Local officials made some effort to mitigate anti-Semitic measures by the Nazi occupying force, and as such refused to require Jews to wear identifying yellow stars and had most former Jewish businesses returned after the war. Officials in the registration department procured false documents for some of those who fell within categories suspected by the Germans. The anti-Jewish measures were not carried out systematically. Some well-known Jews lived through the occupation in comparative openness, including Marianne Blampied, the wife of artist Edmund Blampied. Three Jewish women of Austrian and Polish nationality, Therese Steiner, Auguste Spitz, and Marianne Grünfeld, had fled Central Europe to Guernsey in the 1930s but had been unable to leave Guernsey as part of the evacuation in 1940 because they were excluded by UK law. Eighteen months later, Steiner alerted the Germans to her presence. The three women were deported to France in April 1942, and were later sent to Auschwitz where they died. Plaque: "From the rear of this building 1,186 English born residents were deported to Germany in September 1942. In February 1943 a further 89 were deported from another location in St. Helier." On specific orders from Adolf Hitler in 1942, the German authorities announced that all residents of the Channel Islands who were not born in the islands, as well as those men who had served as officers in World War I, were to be deported. The majority of them were transported to the south west of Germany, to Ilag V-B at Biberach an der Riss and Ilag VII at Laufen, and to Wurzach. This deportation order was originally issued in 1941, as a reprisal for the 800 German civilians in Iran being deported and interned. The ratio was 20 Channel Islanders to be interned for every German interned but its enactment was delayed and then diluted. The fear of internment caused suicides in all three islands. Guernsey nurse Gladys Skillett, who was five months pregnant at the time of her deportation to Biberach, became the first Channel Islander to give birth while in captivity in Germany. 45 of the 2,300 deported would die before the war ended. Charles Machon: brainchild of GUNS. Died in Hamelin prison [de]. Plaque: "During the period of the German occupation of Jersey, from 1 July 1940 to 9 May 1945, many inhabitants were imprisoned for acts of protest and defiance against the Occupation Forces in H.M. Prison, Gloucester Street, which stood on this site. Others were deported and held in camps in Germany and elsewhere from which some did not return." The size of the population actively resisting German occupation in continental European countries was between 0.6% and 3%, and the percentage of the islands' populations participating in active resistance was comparable. From a wartime population of 66,000 in the Channel Islands a total of around 4000 islanders were sentenced for breaking laws (around 2600 in Jersey and 1400 in Guernsey), although many of these were for ordinary criminal acts rather than resistance. 570 prisoners were sent to continental prisons and camps, and at least 22 Jerseymen and 9 Guernseymen did not return. Willmott estimated that over 200 people in Jersey provided material and moral support to escaped forced workers, including over 100 who were involved in the network of safe houses sheltering escapees. No islanders joined active German military units though a small number of UK men who had been stranded on the islands at the start of the occupation joined up from prison. Eddie Chapman, an Englishman, was in prison for burglary in Jersey when the invasion occurred, and offered to work for the Germans as a spy under the code name Fritz, and later became a British double agent under the code name ZigZag. Listening to BBC radio had been banned in the first few weeks of the occupation and then (surprisingly given the policy elsewhere in Nazi-occupied Europe) tolerated for a time before being once again prohibited. In 1942 the ban became draconian, with all radio listening (even to German stations) being banned by the occupiers, a ban backed up by the confiscation of wireless sets. Denied access to BBC broadcasts, the populations of the islands felt increased resentment against the Germans and increasingly sought to undermine the rules. Hidden radio receivers and underground news distribution networks spread. Nevertheless, many islanders successfully hid their radios (or replaced them with home-made crystal sets) and continued listening to the BBC despite the risk of being discovered by the Germans or being informed on by neighbours. The regular raids by German personnel hunting for radios further alienated the occupied civilian populations. A shortage of coinage in Jersey (partly caused by occupying troops taking away coins as souvenirs) led to the passing of the Currency Notes (Jersey) Law on 29 April 1941. A series of banknotes designed by Edmund Blampied was issued by the States of Jersey in denominations of 6 pence (6d), 1, 2, and 10 shillings (10/–), and 1 pound (£1). The 6d note was designed by Blampied in such a way that the word six on the reverse incorporated an outsized "X" so that when the note was folded, the result was the resistance symbol "V" for victory. A year later he was asked to design six new postage stamps for the island, in denominations of ½d to 3d. As a sign of resistance, he incorporated into the design for the 3d stamp the script initials GR (for Georgius Rex) on either side of the "3" to display loyalty to King George VI. Edmund Blampied also forged stamps for documents for fugitives. The deportations of 1942 sparked the first mass demonstrations of patriotism against the occupation. The illegality and injustice of the measure, in contrast to the Germans' earlier showy insistence on legality and correctness, outraged those who remained behind and encouraged many to turn a blind eye to the resistance activities of others in passive support. Some island women fraternised with the occupying forces. This was frowned upon by the majority of islanders, who gave them the derogatory nickname Jerry-bags. According to the Ministry of Defence, a very high proportion of women "from all classes and families" had sexual relations with the enemy, and 800–900 children were born to German fathers. The Germans estimated their troops had been responsible for fathering 60 to 80 out of wedlock births in the Channel Islands. As far as official figures went, 176 out of wedlock births in total had been registered in Jersey between July 1940 and May 1945; and in Guernsey 259 out of wedlock births between July 1941 and June 1945 (the disparity in the official figures is explained by differing legal definitions of non-marital births in the two jurisdictions). The German military authorities tried to prohibit sexual fraternisation in an attempt to reduce incidences of sexually transmitted diseases. They opened brothels for soldiers, staffed with French prostitutes under German medical surveillance. The sight of brutality against slave workers brought home to many islanders the reality of the Nazi ideology behind the punctilious façade of the occupation. Forced marches between camps and work sites by wretched workers and open public beatings rendered visible the brutality of the régime. Bertram Falle, a Jerseyman, had been elected Member of Parliament (MP) for Portsmouth in 1910. Eight times elected to the House of Commons, in 1934 he was raised to the House of Lords with the title of Lord Portsea. During the occupation he represented the interests of islanders and pressed the British government to relieve their plight, especially after the islands were cut off following D-Day. During June 1944, the Allied Forces launched the D-Day landings and the liberation of Normandy. They decided to bypass the Channel Islands due to their heavy fortifications. As a result, German supply lines for food and other supplies through France were completely severed. The islanders' food supplies were already dwindling, and this made matters considerably worse – the islanders and German forces alike were on the point of starvation. 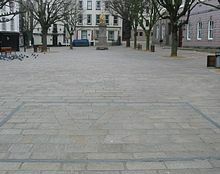 Plaque in the Royal Square, St Helier: On 8 May 1945 from the balcony above Alexander Moncrieff Coutanche, Bailiff of Jersey, announced that the island was to be liberated after five years of German military occupation. On 10 May 1985, Her Royal Highness the Duchess of Kent unveiled this plaque to commemorate the Liberation. A scene on board HMS Bulldog during the first conference with Kapitänleutnant Zimmermann prior to the signing of the surrender document which liberated the Channel Islands on 9 May 1945. Left to right around the table are: Admiral Stuart (Royal Navy), Brigadier General A E Snow (Chief British Emissary), Captain H Herzmark (German Army), Wing Commander Archie Steward (Royal Air Force), Lieutenant Colonel E A Stoneman, Major John Margeson, Colonel H R Power (all of the British Army) and Kapitänleutnant Zimmermann (German Kriegsmarine). "Jerry-bags" were women who had fraternised with German soldiers. This had aroused indignation among some citizens. In the hours following the liberation, members of the British liberating forces were obliged to intervene to prevent revenge attacks. The islands were seriously in debt, with the island governments owing over £10,000,000,:200 having had to pay for the evacuation ships, the costs incurred by evacuees in the UK, the cost of the "occupation forces", being wages, food, accommodation and transport as well as the cost of providing domestics for the Germans, providing civilian work for islanders and needing to pay for reconstruction and compensation after the war. Taxation receipts had fallen dramatically during the war period. Finally, the now worthless Occupation Reichsmarks and RM bank deposits were converted back to Sterling at the rate of 9.36RM to £1. :307 Part of this debt was met by a "gift" from the UK government of £3,300,000 which was used to reimburse islanders who had suffered damage and loss. In addition, the cost of maintaining the evacuees, estimated at £1,000,000 was written off by the government. :214 As one could buy a house for £250 in the 1940s, the gift was equivalent to the value of 17,000 houses. On 9 March 2010 the award of British Hero of the Holocaust was made to 25 individuals posthumously, including four Jerseymen, by the United Kingdom government in recognition of British citizens who assisted in rescuing victims of the Holocaust. The Jersey recipients were Albert Bedane, Louisa Gould, Ivy Forster and Harold Le Druillenec. It was, according to historian Freddie Cohen, the first time that the British Government recognised the heroism of islanders during the German occupation. In Toni's Footsteps: The Channel Island Occupation Remembered (2002) – 52min documentary tracing the history of the Occupation following the discovery of a notebook in an attic in Guernsey belonging to a German soldier named Toni Kumpel. Appointment with Venus, a 1951 film set on the fictional island of Armorel (based on the island of Sark). Another Mother's Son, a 2017 film about Louisa Gould, hiding a Russian war prisoner, starring Jenny Seagrove as Louisa Gould and Ronan Keating as Harold Le Druillenec. Another stage play, Lotty's War by Giuliano Crispini, is set in the islands during the occupation, with the story based on "unpublished diaries". Bachmann, K M (1972), The Prey of an Eagle, Guernsey: Burbridge. A personal record of family life during the German Occupation of Guernsey, 1940-1945. Walker Collection: A collection of philatelic material in the British Library relating to the occupation. ^ Denis, Judd (2012). George VI. London: I.B. Tauris & Co. p. 191. ISBN 9781780760711. ^ a b "11 June 1940". Homepage.ntlworld.com. 11 June 1940. Retrieved 2 November 2012. ^ Cook, Tim (2004). Volume 1 of History of World War II. Marshall Cavendish Corporation. p. 281. ISBN 076147482X. ^ Falla, Frank (1967). The Silent War. Burbridge. ISBN 0-450-02044-4. ^ De Gaulle, Charles. The complete war memoirs of Charles de Gaulle. ISBN 0-7867-0546-9. ^ Marr, James. Bailiwick Bastions. ISBN 0 902550 11 X. ^ Lowe, Roy. Education and the Second World War: Studies in Schooling and Social Change. Routledge, 2012. ISBN 978-1-136-59015-3. ^ Hamon, Simon. Channel Islands Invaded: The German Attack on the British Isles in 1940 Told Through Eye-Witness Accounts, Newspapers Reports, Parliamentary Debates, Memoirs and Diaries. Frontline Books, 2015. ISBN 978-1-4738-5160-3. ^ a b c d e f g h i j k l m n o Sanders, Paul (2005). The British Channel Islands under German Occupation 1940–1945. Jersey: Jersey Heritage Trust / Société Jersiaise. ISBN 0953885836. ^ a b Sherwill, Ambrose. A fair and Honest Book. ISBN 978-1-84753-149-0. ^ "Eleanor Roosevelt and the Guernsey Evacuee | Guernsey Evacuees Oral History". Guernseyevacuees.wordpress.com. 6 December 2010. Retrieved 4 October 2012. ^ Duret Aubin, C. W. (1949). "Enemy Legislation and Judgments in Jersey". Journal of Comparative Legislation and International Law. 3. 31 (3/4): 8–11. ^ a b Turner, Barry. Outpost of Occupation: The Nazi Occupation of the Channel Islands, 1940–1945. Aurum Press (April 1, 2011). ISBN 978-1845136222. ^ Drawmer, Gwen. My Memories of the German Occupation of Sark, 1940–1945. Studio House, 2001. ^ Hamon, Simon (2015). Channel Islands Invaded: The German Attack on the British Isles in 1940 Told Through Eye-Witness Accounts, Newspapers Reports, Parliamentary Debates, Memoirs and Diaries. Frontline Books. p. 214. ISBN 1473851599. ^ a b c "The First Attack on England". Calvin. ^ a b c d e Nettles, John. Jewels and Jackboots. Channel Island Publishing; 1st Limited edition (25 October 2012). ISBN 978-1-905095-38-4. ^ "Guernsey files reveal how islanders defied Nazi occupation". The Guardian. ^ a b Winterflood, Herbert. Occupied Guernsey: July 1940–December 1942. Guernsey Press. ISBN 978-0-9539166-6-5. ^ Tremayne, Julia. War on Sark: The secret letters of Julia Tremayne. Webb & Bower (1981). ISBN 978-0906671412. ^ a b Hamon, Simon. Channel Islands Invaded: The German Attack on the British Isles in 1940 Told Through Eye-Witness Accounts, Newspapers Reports, Parliamentary Debates, Memoirs and Diaries. Frontline Books, 2015. ISBN 978-1-4738-5162-7. ^ a b Evans, Alice. Guernsey Under Occupation: The Second World War Diaries of Violet Carey. The History Press (2009). ISBN 978-1-86077-581-9. ^ Tabb, Peter. A peculiar occupation. Ian Allan Publishing. ISBN 978-0-7110-3113-5. ^ Parker, William. Life in Occupied Guernsey: The Diaries of Ruth Ozanne 1940–45. Amberley Publishing Limited, 2013. ISBN 978-1-4456-1260-7. ^ Le Page, Martin. A Boy Messenger's War: Memories of Guernsey and Herm 1938-45. Arden Publications (1995). ISBN 978-0-9525438-0-0. ^ Le Tissier, Richard. Island Destiny: A True Story of Love and War in the Channel Island of Sark. Seaflower Books. ISBN 978-1903341360. ^ Carre, Gilly. Protest, Defiance and Resistance in the Channel Islands. Bloomsbury Academic (August 14, 2014). ISBN 978-1-4725-0920-8. ^ Cruickshank, Charles. The German Occupation of the Channel Islands. The History Press; New edition (30 Jun. 2004). ISBN 978-0-7509-3749-8. ^ a b Russian State Military Archives, Inventory 500, Documents of the OB West. ^ "Occupation Memorial | Resources | Forced Workers". Thisisjersey.co.uk. Archived from the original on 6 September 2018. Retrieved 10 February 2013. ^ a b c d e f Ginns, Michael (2009). Jersey Occupied: The German Armed Forces in Jersey 1940–1945. Channel Island Publishing. ISBN 1905095295. ^ a b c d e f g h i Willmot, Louise (May 2002). "The Goodness of Strangers: Help to Escaped Russian Slave Labourers in Occupied Jersey, 1942–1945". Contemporary European History. 11 (2): 211–227. doi:10.1017/s0960777302002023. JSTOR 20081829. ^ a b Subterranea Britannica (February 2003). "SiteName: Lager Sylt Concentration Camp". Retrieved 6 June 2009. ^ Alderney, a Nazi concentration camp on an island Anglo-Norman Matisson Consultants. "Aurigny ; un camp de concentration nazi sur une île anglo-normande (English: Alderney, a Nazi concentration camp on an island Anglo-Norman)" (in French). Archived from the original on 6 September 2018. Retrieved 6 June 2009. ^ a b c d e f g h i j k l Fowler, Will. The Last Raid: The Commandos, Channel Islands and Final Nazi Raid. The History Press. ISBN 978-0750966375. ^ a b Forty, George. ATLANTIC WALL: CHANNEL ISLANDS:. Pen and Sword (June 2002). ISBN 978-0850528589. ^ "Lager Wick, Jersey, Channel Islands". Research Projects. Department of Archaeology, University of Cambridge. 1 April 2016. Retrieved 6 September 2018. ^ "Gladys Skillett : wartime deportee and nurse". The Times. London. 27 February 2010. Retrieved 9 March 2010. ^ "The 22 Islanders who died in Nazi captivity". Jersey Evening Post. 28 January 2013. ^ a b c d e f g "Guernsey resistance to German occupation 'not recognised'". BBC. 3 October 2014. ^ Willmot, Louise, (May 2002) The Goodness of Strangers: Help to Escaped Russian Slave Labourers in Occupied Jersey, 1942-1945," Contemporary European History, Vol. 11, No. 2, p. 214. Downloaded from JSTOR. ^ Charybdis Association (1 December 2010). "H.M.S. Charybdis: A Record of Her Loss and Commemoration". World War 2 at Sea. naval-history.net. Retrieved 3 August 2012. ^ James, Barry (4 December 1996). "Documents Show Government's Concern : Was Duke of Windsor A Nazi Sympathizer?". The New York Times. ^ Tabb, Peter. A peculiar occupation. Ian Allan Publishing. ISBN 978-0711031135. ^ Durnford-Slater 1953, pp. 22–33. ^ "Fortress Alderney". Battlefields. 9 May 1945. Retrieved 2 March 2018. ^ Partridge, Colin. The Fortifications of Alderney. Alderney Publishers. ISBN 0-9517156-0-7. ^ "HL Deb 04 October 1944 vol 133 cc365-6". Hansard. ^ "Guernsey evacuees and kind canadians during the second world war". Exodus. ^ Marshall, Michael (1967). Hitler envaded Sark. Paramount-Lithoprint. ^ Crosswell, Daniel K. R. Beetle: The Life of General Walter Bedell Smith. University Press of Kentucky, 2010. p. 679. ISBN 9780813126494. ^ "Sarnia Chérie (Guernsey anthem) - Sung on Liberation Day in 1945". ^ Cruickshank, Charles. The German Occupation of the Channel Islands. The Guernsey Press Co, Ltd.
^ Ogier, Darryl. The Government and Law of Guernsey. States of Guernsey. ISBN 978-0-9549775-1-1. ^ "Guernsey's Liberation Day story". Retrieved 13 May 2012. ^ "Pubs1". Ciosjersey.org.uk. Retrieved 10 February 2013. ^ Lempriére, Raoul. History of the Channel Islands. Robert Hale Ltd. p. 229. ISBN 978-0709142522. ^ "La Piaeche d'la Libérâtiaon". Guernsey Museum and Art Gallery. Retrieved 17 March 2013. ^ "Jersey needs better World War II memorial, occupation society says". BBC. 8 February 2013. Retrieved 17 March 2013. ^ Sebastian Scotney (15 May 2013). "Podcast: A Few Minutes with... Gwyneth Herbert". London Jazz News. London Jazz. Retrieved 6 October 2013. ^ The Blockhouse (1973), IMDb. This page was last edited on 19 April 2019, at 19:06 (UTC).